Our great friends Mike Young and Jeff joined Javier Hernandez (General Manager, Nosara Paradise Rentals) for a sunset cruise. They caught lots of fish in a short amount of time: four 12lbs. Black tuna, a 10lbs. Yellowfin Tuna, a 12lbs. Rainbow runner, and this beautiful 35lbs. Rooster fish, which was released of course. 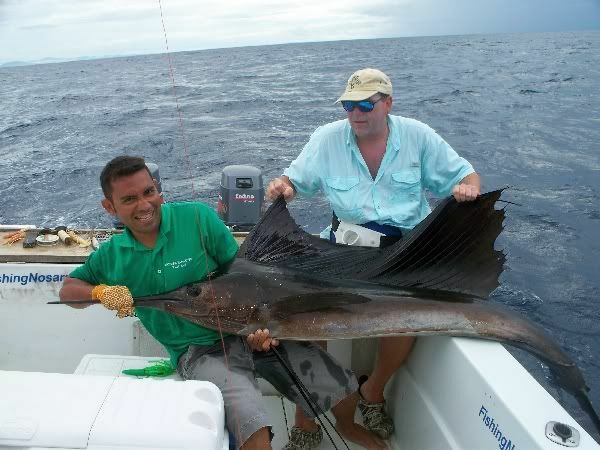 Earlier in the week Manuel nabbed this excellent Sailfish…c’mon Manuel, save some for the clients! Captain William has the Wanderer dialed in for the new season, and in just two short months this boat has gone from the newcomer to a contender for top boat in the area. On December 26, 2009 client Caleb Rose, his father Chris and sister Vita were on board the Wanderer. 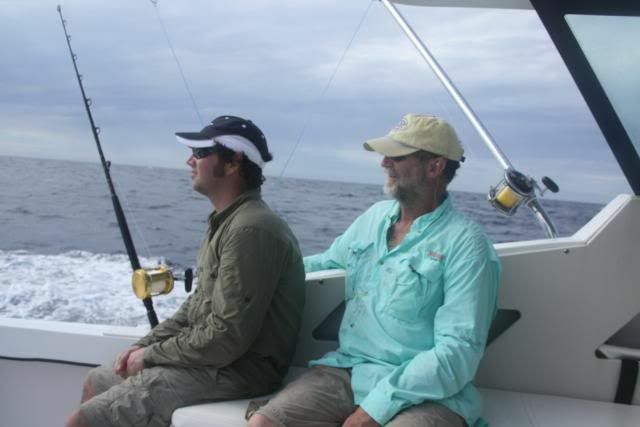 Most recently Captain Vibert welcomed client John for two days of fishing on October 13th and 14th. 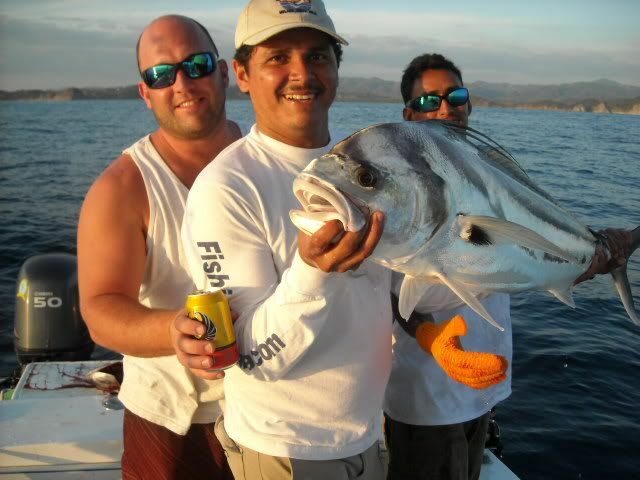 The first day brought John and Captain Vibert tons of bites, and they reeled in five Dorado ranging from 20lbs. to 30lbs. They also grabbed four 10lbs. Black tunas and five 8lbs. Cobias. The second day they loaded up to go hunt the big boys out in the deep water. The first hit was a small black tuna weighing around 10lbs. Once the sun got overhead, the flashes of turquoise and gold came up from the deep; the telltale sign of a Dorado frenzy. One line popped off, then another. As fast as Vibert Jr. could boat one fish, another fish was on! 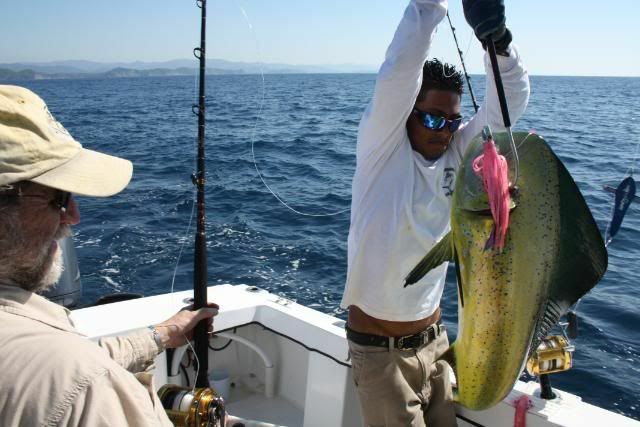 By the end of the bite they had boated five Dorado ranging from 20lbs. to 40lbs. They weren’t quite done yet. With the crew dialed in and the weather cooperating, John went looking for the billfish. 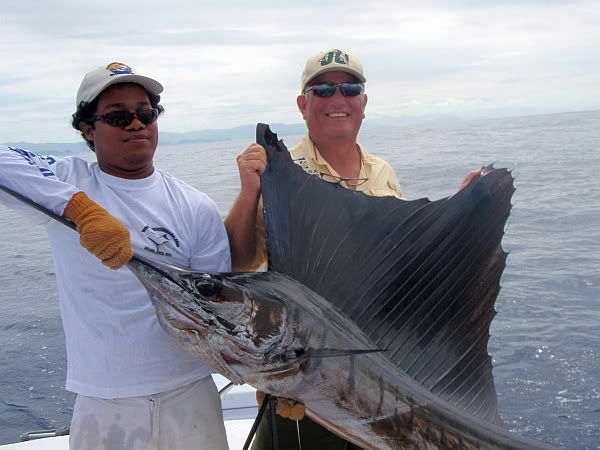 A few sailfish were sniffing the bait and Vibert showed the patience that 30 years on the water imparts. 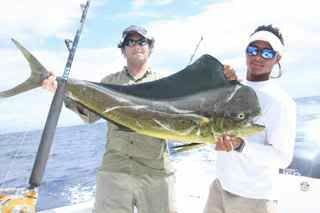 Finally one of the big sailfish hit hard! John belted up and engaged the fish in a spirited half-hour duel. He brought it into the boat where the crew estimated a weight of well over 100lbs! 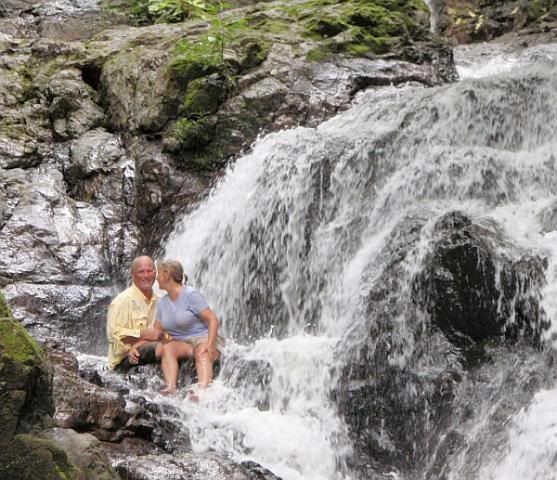 August 7th marked the arrival of newlyweds Terry and Miriam Alexander to the shores of Nosara and the beginning of four awesome days fishing. Mr. Alexander is the head baseball coach of the Jacksonville University Dolphins, a Florida State alum, and (as it turns out) one heck of a fisherman. On the first day they caught six 20lbs. 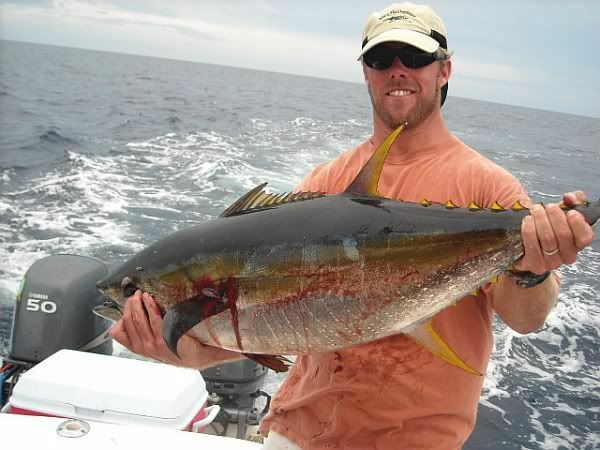 Yellowfin tuna and a 56lbs. 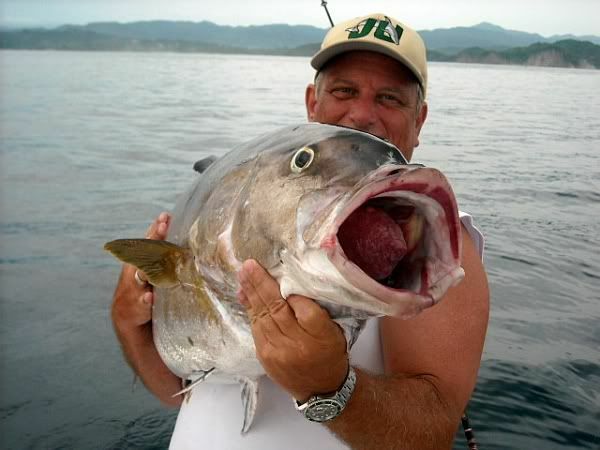 Amberjack. They followed up on the 8th with three 12lbs. Blackfin tunas and yet another 20lbs. Yellowfin tuna. 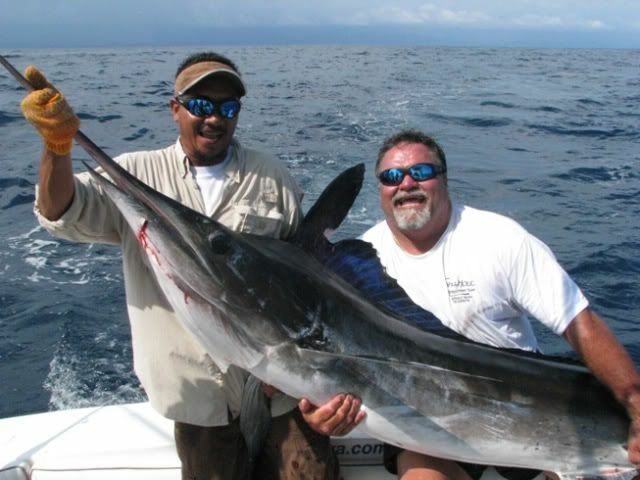 They went out marlin hunting on August 9th and they managed to raise a 400lbs. Black marlin, but couldn’t quite get the hooks into the great fish before he escaped. After enjoying the sights around the Nosara Paradise Rentals campus, Terry and Miriam Alexander booked one more day on the blue water on August 11th. 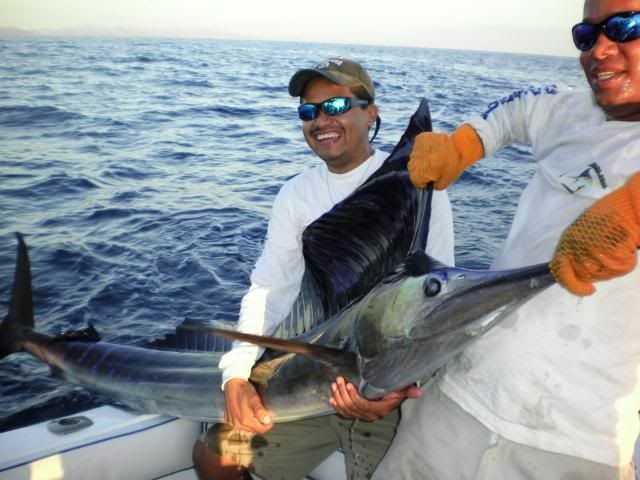 What followed was a full-fledged sailfish bonanza. After a half-dozen or so promising strikes, the couple managed to catch and release three biggums: 120lbs., 125lbs., and a glorious 150lbs. July 28th marked the arrival of one of our favorite clients, Richard Moran. 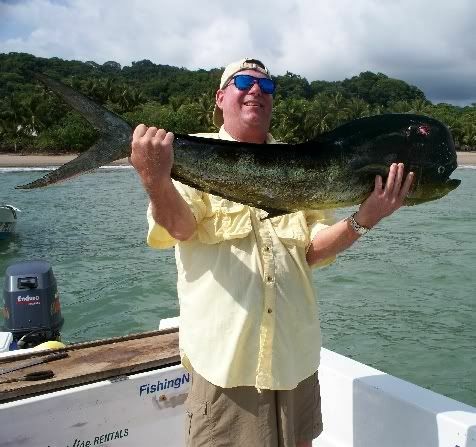 Mr. Moran brought the whole family to Nosara, and fortunately he caught enough fish to feed them all. On his first day, Richard filled the fishbox with a 10lbs. 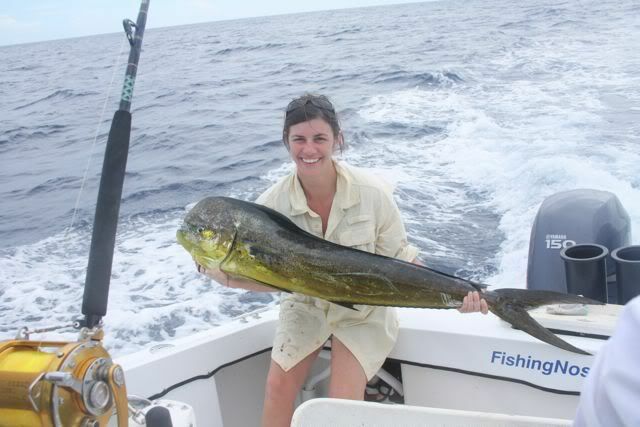 Yellow tuna, two 15lbs. Jacks, and six 10lbs. Black tunas, plus he reeled in a 10lbs rainbow runner and a little needle fish for good measure. Then he invited Javier and Craig of Nosara Paradise Rentals along for the ride, and the extra hands were put to good use as the spread was literally getting shredded by some aggressive sailfish. Richard caught and released a massive 120lbs. 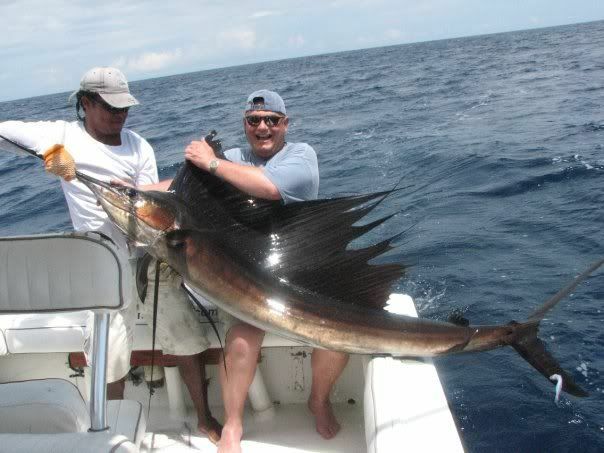 Sailfish, the biggest single fish of his trip, but not his best total day of fishing. That came on August 3rd when, once again joined by Craig Sutton, Richard Moran successfully fought four 50lbs. Yellowfin tuna! These are by far the biggest tuna we’ve seen in these waters this year, and it seems as though this tuna bite will hold strong in the coming months as the rainy season approaches. 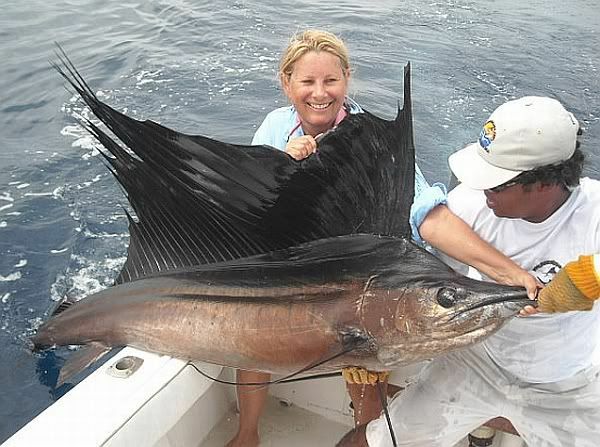 On May 16th clients Andy and Debbie had a Sailfish field-day. 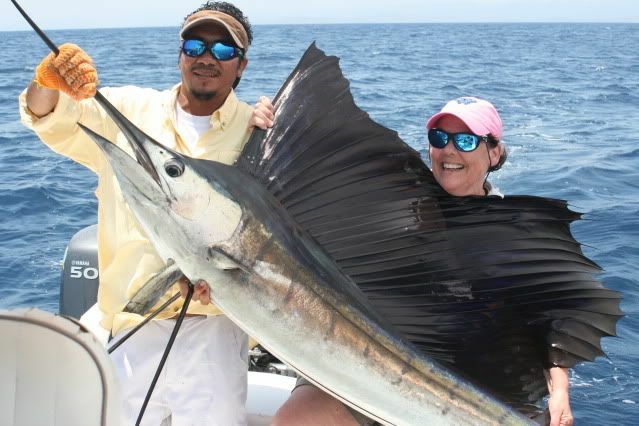 Throughout the day, sixteen of the big beauties came tearing through the spread; by the end of the day they had caught and released seven Sailfish, all 110lbs! 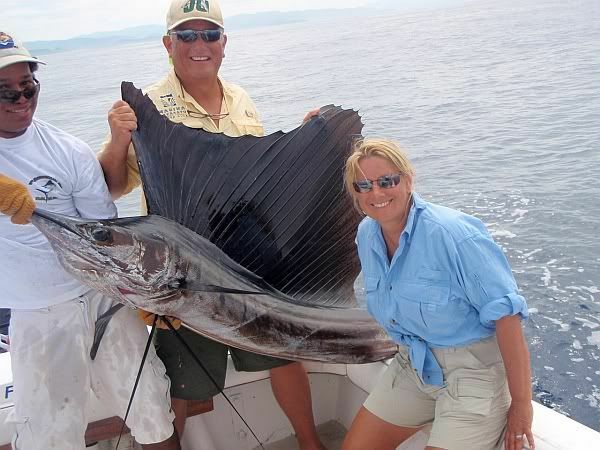 They came back in two days and raised seven more Sailfish, and this time they released four of the monster fish, one weighing over 120lbs! 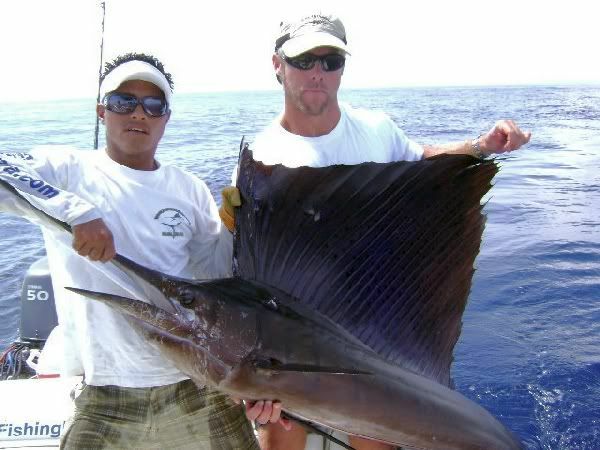 It’s been said that once you catch a big sailfish, it’s all you can think about for the next week. This is clearly true for Andy and Debbie, who booked two more trips with Captain Eduardo on May 20th and 22nd. These additional trips added five more 120lbs. 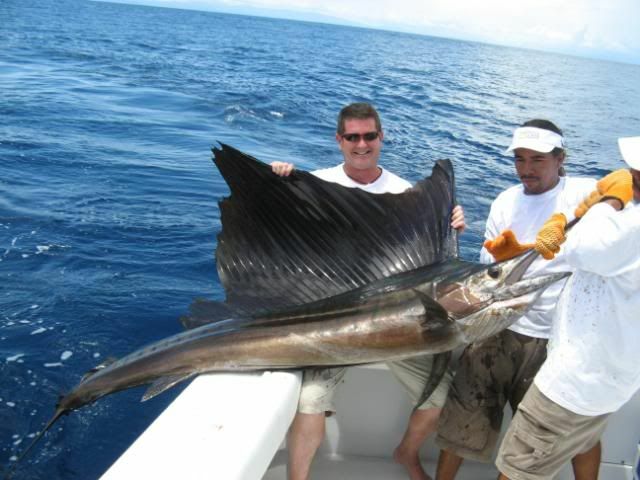 Sailfish to their record, and brought them a couple of 20lbs. dorados. Captain Dan Parker and his wife Charlene started off the second day with three 15lbs. yellowfin tunas and three 20lbs. dorados. A few minutes later a 40lbs. 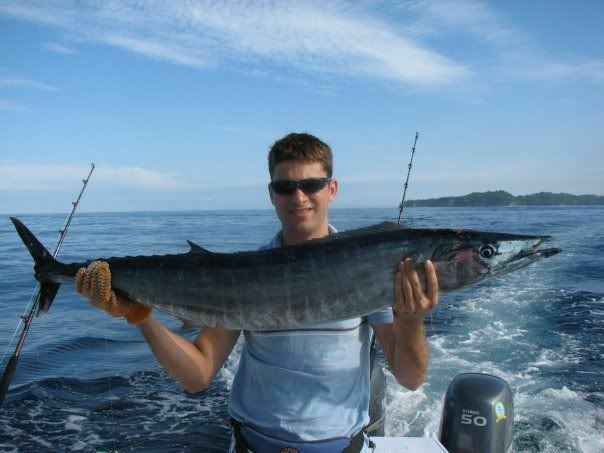 wahoo hit the fish box, there was only one thing left to get. Sure enough, a 250lbs. Marlin came tearing through the spread and Mr. Parker hooked him up, completing a trip that saw a little bit of everything.